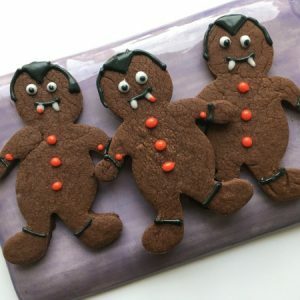 Better bite these vampire chocolate sugar cookies before they bite you! A chocolatey cookie the kids will love this Halloween. Begin by making a batch of chocolate sugar cookie dough. I really like the recipe on Food Network.com, so why reinvent the wheel? Roll out one half of the dough on a lightly floured surface. Roll the dough to 1/4 inch thickness. Use a standard gingerbread man cookie cutter. Be sure to flour the cookie cutter very well. I find that the narrow arms and legs can break easily, unless you flour the cookie cutter well. Bake the gingerbread men on a parchment paper lined baking sheet, in a 350°F oven. Bake until they are no longer shiny…about 10-12 minutes. Transfer the cookies to a rack to cool completely. Make the royal icing. Mix together the icing sugar, meringue powder and 2 tsp of water, add one tsp of water at a time until the icing reaches the desired thickness. You want the icing to be thick because you are going to be making lines with it. Scoop a third of the icing into a separate bowl and mix in the red food colouring. Once fully mixed, transfer to a resealable bag. Repeat to make a black icing and fill one bag with a uncoloured, white icing. Use scissors to cut a small hole in one corner of the bag. Make the hole very small…you can always cut it larger, if need be. Now that the cookies have cooled it is time to transform the gingerbread men into vampires. Use the black to make the signature vampire hair style. The white and black for the eyes and the teeth. I added a tiny dot of red to some of the vampire’s teeth…they must have had a snack. Compete the vampire outfits however you like. I added some buttons, shirt and pant cuffs and red cufflinks.